The Labour Ward Handbook, second edition, is a succinct manual that provides detailed clinical practice guidelines for the care of women in labour. Dealing more with the practice than the theory of labour ward management, this book is designed to be a ready guide for use in the delivery suite by the busy clinician. The format has been specifically designed to make retrieval of information quick and simple. Relevant pages can be reproduced and filed in the patient's case-notes thus serving not only as an aide memoire and checklist, but also as a supplementary record of the care provided. 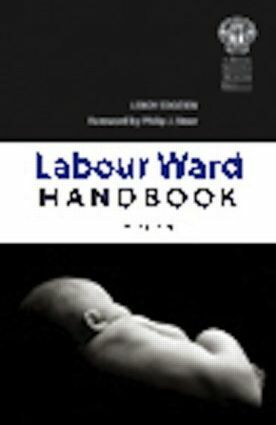 The Labour Ward Handbook is essential reading for practising obstetricians of all grades, midwives, labour ward managers, and all other medical professionals who are interested in the conduct of labour and risk management in the delivery suite. If you work on the labour ward, this is the book to have with you at all times. As a student midwife due to qualify in March, I have purchased this book in preparation for my career in midwifery. It is a consice practical guide that gives detailed instructions on how to manage clients on labour wards. This book addresses all aspects of care including communication and risk management. RCOG guidelines relating to care of women in labour, NICE guidelines on IOL and fetal monitoring, CNST standards for maternity Care and Cochrane reviews are all used in this book. I would recommend this book to anyone working within the midwifery profession. This book is so useful on the ward. It's easy and quick to look things up as it uses very clear text with bold print and plenty of bullet points. Guidelines are taken from NICE, it's evidence-based and extremely relevant for practising in the NHS. As a third year Midwifery student I find it invaluable as a quick reference - it's really helpful for plans of care, tests to carry out etc, especially for more complicated cases. Midwives, students and doctors alike have commented positively on it at work. It's a great book if you've studied the theory, but just want a practical guide to applying it on the ward or if you're just starting out and need a few prompts. "It's a really good idea to provide a generic set of guidelines applicable to all labour ward settings: it's very easy to flick quickly to relevant content. This comprehensive guide to the labour ward will be a useful addition to any unit."